NCR EasyPoint 42 w VenSYS.pl | VenBOX Sp. z o.o. The NCR EasyPoint 42 is a flexible, feature-rich self-service system. It embodies the unique experience of the company NCR to create such devices. The NCR EasyPoint 42 kiosk supports both Web applications and regular applications created for Microsoft ® Windows ® ; It has a rich set of multimedia tools and peripherals, giving you truly unlimited opportunities to provide new services to customers, whether it is support for a loyalty system, printing coupons, providing information about products or ordering goods to your home. Flexibility means choice, and NCR EasyPoint 42 offers more freedom of choice from a wide variety of possible configurations regarding display type, processor performance, peripherals, and installation methods. The NCR EasyPoint 42 kiosk is based on the Intel Embedded ATX platform, equipped with a high-performance graphics system and the fastest Intel processors, providing enough processing power for even the most demanding software applications. The NCR EasyPoint 42 kiosk has a full suite of multimedia tools and integrated peripherals, such as a barcode scanner, printer and card reader, to create a complete self-service solution based on it. The NCR EasyPoint 42 kiosk can be installed almost anywhere - on a desk, shelf, wall, stand, or pedestal. And all these advantages have a device that is significantly smaller in size and takes up much less space than any other kiosk. 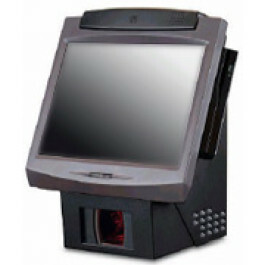 The NCR EasyPoint 42 kiosk is designed for years of reliable, trouble-free service with the highest workloads. It is designed to work in a harsh environment, the parameters of which (the range of changes in temperature and humidity, dust pollution) are significantly different from the "greenhouse" office conditions. Kiosk NCR EasyPoint 42 is thoroughly tested for mechanical and thermal loads. The NCR EasyPoint 42 has an elegant and thoughtful design. All its components are optimally combined into a single whole, which significantly increases the reliability of the entire device compared to kiosks, which are “mastered” from a regular personal computer and peripheral devices placed in the case. 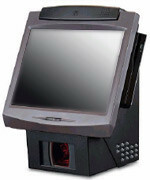 A minimum number of tools is required to service the NCR EasyPoint 42 kiosk. All of its main components are placed on a sliding sled, which allows them to service inspection and replacement in record time. Time is money, and thanks to the unique design features of the NCR EasyPoint 42, this saying takes on literal meaning, since the maximum availability of the device for customers is now guaranteed, and your business does not lose money due to downtime.